Even if crossed swords hanging above the fireplace can still have their own charm they originate from a bygone era. Images and artefacts from an often violent past have an established place in the aesthetic attraction's cabinet of horrors. The moral of historically violent imagery nourishes itself from the desire not to forget.The passing of time is an important graph for the ethical and moral acceptance of such images. So what happens if we change a cast porcelain figure of a mounted Napoleon with a Kalashnikov? How do we feel when the classical portraits of past battles are updated with images of modern wars? Are we allowed to find a stealth bomber aesthetically pleasing? 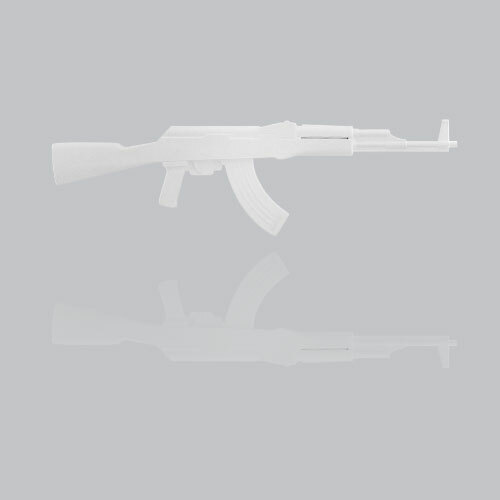 Is a machine gun made of white gold pure and innocent, valuable, tasteless or just reprehensible.